The Youngstown State men's and women's track and field teams swept the 60m hurdles and the shot put on Friday night at the YSU College Invitational at the WATTS. In the hurdles, Amber Eles and Chad Zallow each finished first while Jaynee Corbett and Ryan Booth each won their shot put events. Eles won the 60m hurdles with a time of 8.65 seconds, finshing .25 ahead of the second place finisher. Zallow clocked a winning time of 7.77 seconds in his hurdles race to win by .32 seconds ahead of Ashland's Devin Snowden. Jaynee Corbett won the shot put with a toss of 13.79 meters. Corbett took first with a throw that was 0.20 meters longer than Ohio's Jordan Porter. Ryan Booth won the shot put with a throw of 17.56m. Booth had an impressive victory taking first by 0.60 meters. 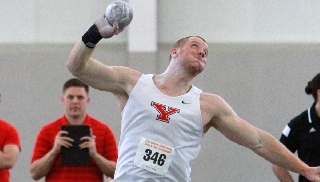 YSU's Dom Westby was third in the shot put at 15.88m. Carl Zallow took first in the 60m dash with a time of 6.82 seconds winning by .10 seconds. Brendon Lucas won the 400m dash with a time of 48.63 seconds. Lucas won his race by .11 seconds. The Penguins had six second-place finishes in the meet. Michelle Klim was second in the 5,000-meter run with a time of 17:49.15 Abby Jones was second in the high jump clearing 1.65m while Chenara Lacey was third at 1.60m. Dylan Latone was second in the pole vault clearing a height of 4.55m. In the long jump, Isaac Agyemang had a leap of 6.79m. Corbett was second in the weight throw with a toss of 17.26m. Jaliyah Elliot was second in the 60m dash with a time of 7.77 seconds. Keishawnna Burts was third in the 400m with a time of 57.70 seconds. Anthony Butler was third in the triple jump with a leap of 14.19m and third in the long jump with a leap of 6.74m. Carl Zallow was fourth in the 200m dash with a time of 21.77 seconds. In the men's high jump Tim Holzapfel was fourth clearing a height of 1.95m. The Penguins are next in action on next Friday and Saturday at the Penn State National Elite Invitational and the SPIRE Midwest Indoor Open.